"I feel like I've always been visual," says Mary-Ellen Power. "I can see the good in places, especially because my dad's a realtor too and homes, it's always been in my blood." Thanks to the housing know-how in their genetic makeup, both Power and her brother Graeme have made careers in real estate, branched out together in the furniture-making business with Power Designs and, most recently, started flipping houses. "We had a client who was interested in the house and wanted to do a quick flip on it, but the deal fell through. We were like, 'Why don't we do it? If they can, we can,'" she says of the small potential-filled place in Dartmouth's in-demand Crichton Park neighbourhood. "It was just kind of like a light-bulb moment." The Power siblings saw past the house's deficiencies, like how the kitchen had no cabinetry at all, in hopes of making its selling features—a corner lot and big backyard, new windows, a new roof, hardwood floors—shine as bright as they knew they could. "And I think just the neighbourhood, like they say in real estate—location, location, location is everything," says Mary-Ellen, who's currently living in the house. 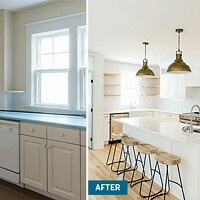 She and her brother initially decided to renovate just the main floor of the two-bedroom bungalow, but once they'd budgeted, hired contractors and dug into the work they decided to go big on the little home and gut the basement too. 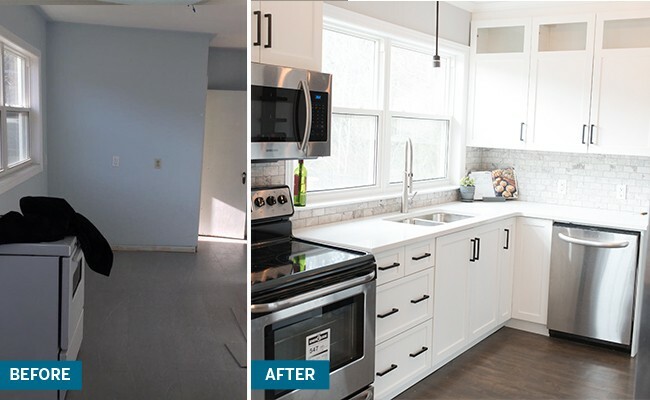 The kitchen, or lack thereof, was their biggest concern, as was refinishing all of the hardwood floors, but the basement wound up getting the biggest makeover. 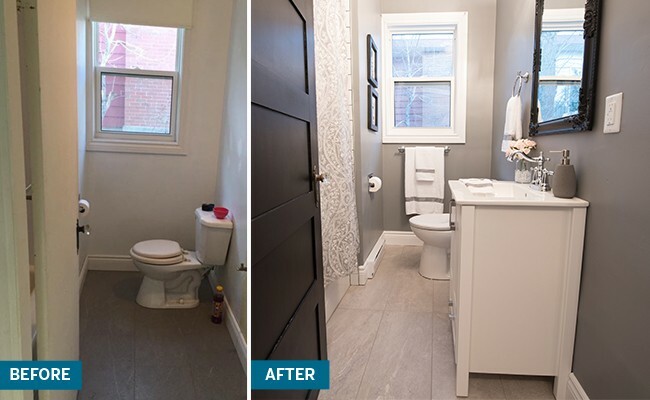 "It's difficult to sell a two-bedroom house so it was a no-brainer," says Mary-Ellen of the project that resulted in two extra bedrooms, a brand-new bathroom and a rec room. It meant completely re-framing, re-wiring and insulating the floor, putting in new windows and installing baseboard heating. 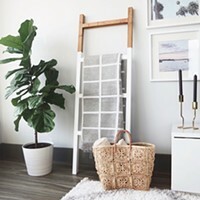 The decor was inspired by a lot of Pinterest peeping, but mostly took its cues from the one piece in particular—the doors. The Powers re-trimmed all of them to create a five-panel look and painted them black, a perfect modern accent to the bright, neutral walls and natural, rustic looking hardwood details like the floors, and handmade Power Designs pieces like a headboard, coffee tables and dining room table. 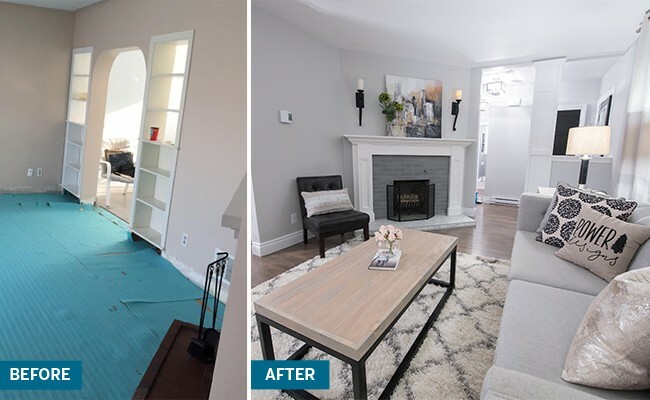 "We did a ton of looking online on Kijiji for stuff, we found our backsplash on there—it was marble and this guy was selling it for dirt cheap, it was leftover from a reno he did. We found a cool mantle a guy was selling and put that up around the fireplace," says Mary-Ellen. "Other than the furniture we made, we bought everything off Kijiji." Though she's loved living there, Mary-Ellen hopes to be passing on the house to a new owner in the spring. But before taking on their next flip, she and her brother will take their own advice: "I think the biggest thing is to not take on too much. Let the professionals do their work, especially when it comes to electrical and plumbing."